Enjoy gallery talks, artist receptions, music, live performances, hands-on artmaking, and three floors of open artists’ studios. 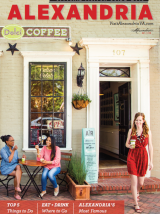 Alexandria is a vibrant and creative collection of neighborhoods and cultures. It is one of the top 25 most diverse cities in the country and is located in the nation's most vibrant arts region. Celebrate our home town and take part in its next renaissance.